There can be few better days in the Church’s calendar than the Feast of St Benedict to announce the appointment of the Venerable Jackie Searle as the next Bishop of Crediton. The announcement was made from Downing Street this morning. Prior to her ordination, Jackie trained as a Primary School teacher, specialising in English. Following her ordination and two curacies in London, Jackie became a Lecturer in Applied Theology at Trinity College, Bristol. From there she moved to the Diocese of Derby becoming Vicar of Littleover, Rural Dean and Dean of Women’s Ministry. 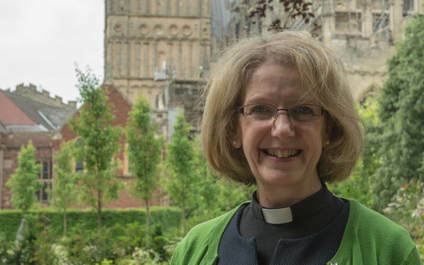 In 2012 she moved to her current appointment as Archdeacon of Gloucester and Canon Residentiary of Gloucester Cathedral. She is married to David Runcorn and they have two grown up children, Joshua and Simeon. Jackie is a person of wide sympathies with a deep love of Christ. She has been a Training Partner with Bridge Builders for several years, specialising in conflict transformation, and will bring to her new role the same mixture of compassion, integrity and professionalism that has characterised all her work. She understands the challenges and opportunities of rural ministry well and will enrich the life of the church in Devon in all sorts of ways. I look forward to welcoming her to the Diocese this autumn. She will be consecrated in London on the Feast of St Vincent de Paul, Thursday 27th September, and her welcome service will be in Exeter Cathedral at 4pm on Sunday 14th October. More details about both services will follow in due course. As Bishop of the Diocese I am committed to the flourishing of us all under God and this letter gives me the opportunity to repeat my commitment to the Five Guiding Principles set out by the House of Bishops. As we prepare to welcome Bishop Jackie, I pray that the spirit of generosity and joy that has characterised our life in Christ may continue to permeate our partnership in the Gospel in the years ahead.